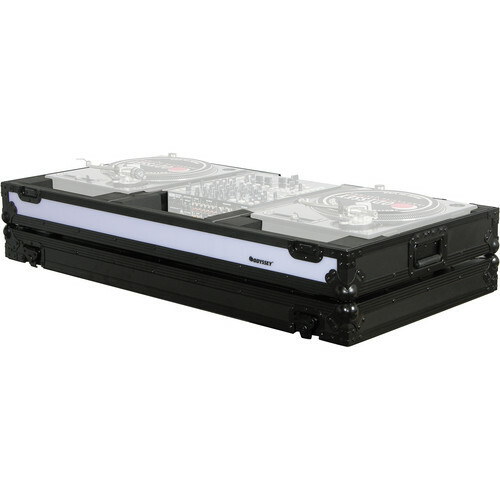 The black Flight FX Series Turntable DJ Coffin for Two Turntables in Battle Mode and 12" Width Mixer with Wheels from Odyssey Innovations Designs is unique in its design since it features a color changing multi-mode LED panel running along the front of the case. When it comes to generating special effects during your gig, this case adds a touch of snap to your performance. And, as a "wow" effect, the panel can be linked to additional FX cases for creating even more pizazz. The panel is adjustable to any of seven colors or set to generate in a color changing mode. The case is made from 3/8" plywood and is accented by chrome plated steel hardware, aluminum trim and foam lined interior. Black anodized hardware and heavy-duty ball corners provide extra protection from bumps and abrasions both during transport or performance. The handles and latches are all recessed. The built-in wheels make navigating from the parking lot to the venue easier not to mention easing the load of the 49 lb case. For ventilation and heat dissipation purposes, there are ventilation pits for the mixer and media player. Cable management is simple using the ports on the bottom rear of the case. To offer even more security for your gear, Odyssey provides width adjustment foam strips that help keep the equipment in place. Backed by Odyssey's limited lifetime warranty, this case delivers peace of mind through its construction, features and ease of use.